(CNN) -- The International Tennis Federation (ITF) has confirmed that Richard Gasquet has been provisionally suspended after the French star admitted testing positive for cocaine at the Miami Masters tournament in March. 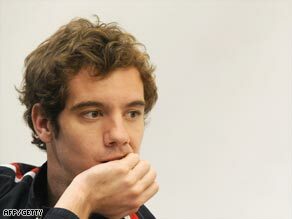 Gasquet is left to contemplate a possible two-year ban from tennis. A spokesman for the ITF Anti-Doping Programme told CNN Gasquet's ban from competition has been put in place in accordance with rules revised by the 2009 WADA Code. "Players may now be served with a provisional suspension if their A sample tests positive for a non-specified substance (eg a hormone or steroid). Richard Gasquet has consequently received a provisional suspension according to the rules of the programme." The spokesman added: "In accordance with the programme's confidentiality provisions, the ITF will not release any further details until an independent anti-doping tribunal has issued its decision, which will be in due course." The former world number seven issued a statement to news agencies on Sunday after the French sports paper L'Equipe had revealed in a report on its Web site the failed doping tests. Gasquet, who has slipped to 23rd in the rankings, faces a two-year ban from tennis, but is hoping for leniency. "The test of the B sample submitted at the end of March 2009, confirmed the positive result of the A sample taken on the same day," he said. "I want to prove my innocence and will explain myself at an appropriate time," he added. If Gasquet exercises his right to a hearing, an independent anti-doping tribunal will be held, ordinarily within 60 days of the player's request. The tribunal will determine whether an offense has been committed, and if so, what penalty will be issued. Earlier Sunday, the French Tennis Federation (FFT) admitted they would be "very surprised" if the reports proved to be true. The FFT added in a statement released to Press Association that it "would be very sad for Richard Gasquet himself, for tennis in general, for French tennis in particular, whose image would be dented" if the positive test was officially confirmed. Gasquet, a teenage prodigy, has failed to match his early promise but did reach the semifinals of Wimbledon in 2007. Only this week the 22-year-old was confirmed as one of the star attractions at the pre-Wimbledon tournament at Eastbourne, but now faces a battle to clear his name. In ATP tennis action on Sunday, Novak Djokovic continued his fine form on clay with victory in his home tournament in Belgrade. The Serbian top seed beat Lukasz Kubot of Poland 6-3 7-6 in the Serbia Open final. It was Djokovic's fourth successive appearance in an tour final. The BMW Open title in Munich went to Czech Tomas Berdych who edged out Mikhail Youzhny of Russia 6-4 4-6 7-6.